Preheat grill for medium heat. In a small bowl crush garlic with the salt. Mix in cayenne pepper and paprika and then stir in olive oil and lemon juice to make a paste. Toss the shrimp with the sauce until coated. Lightly oil the grill grate. Cook shrimp 2 to 3 minutes per side or until opaque. 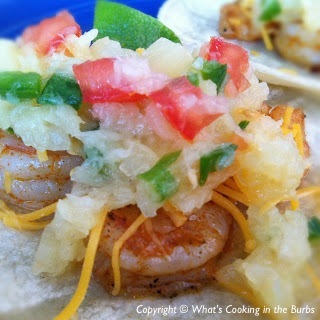 To complete the tacos add 3-4 shrimp on a flour tortilla along with some shredded cheese. (optional) Top with pineapple salsa. Enjoy! Wow, the shrimp taco is cool, but the salsa looks amazing. Thanks so much for sharing this dish with us on foodie friday. have yet to have a shrimp taco and these look way too good to pass up! will have to make them one of these fridays! fruit salsa is the best too-sweet and spicy! thank you for sharing!